Longman New Real Toeic Full Actual Test Get Best TOEIC Preparation Materials and Practice Book for Reading, Writing, Listening, and Speaking. Get TOEIC Materials , Tips, Tricks. Practice more and boost your score. 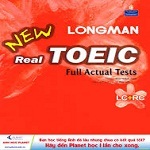 New Real Longman TOEIC Actual for Reading Comprehension Tests and Full Actual Tests is very different! “Here is saying that those who learn the TOEIC textbooks New Longman Real TOEIC acknowledged. This difference is reflected in the efficiency of the review, and help you achieve a high score. TOEIC exam preparation materials is one of the members of the “family” Longman, support, training you, gives you the confidence to take TOEIC. Unlike New Book Longman Real TOEIC Actual Tests for Listening Comprehension blue book, the focus refresher to help you read the part of New TOEIC exam.